We have a Halloween deco mesh wreath idea that’s super simple and scary good. Spookify your front door by recreating this Halloween wreath, complete with fake spiders for a creepy-crawly look. Get into the spirit of the holiday with this craft and greet all your guests, ghouls, and trick-or-treaters in a fantastic way! Cut all chenille stems in half. 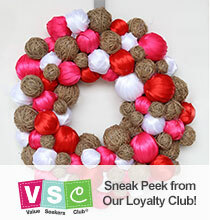 Twist chenille stems at various points around the edges of the wreath leaving 3″ ends open to hold the mesh in place. Unwind the first deco mesh roll and create a 3″ loop at the end of the roll. 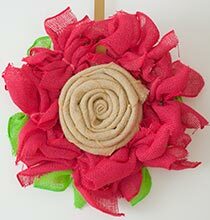 Secure the loop to wreath form by twisting a chenille stem around the loop twice. 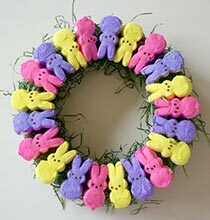 Take an 8″ bunch of deco mesh, bunch and secure the mesh around the wreath using the next closest chenille stem, repeating until you reach the end of the roll. Create a loop at the end of the roll and secure by twisting a chenille stem around the loop twice. Repeat with the next six rolls of mesh, alternating colors, and alternating which chenille stems you use to secure the mesh. Insert plastic spiders into the deco mesh, securing with chenille stems. Cut Halloween floral branches and stems to size and insert them throughout the wreath. Hang your new Halloween wreath and enjoy! 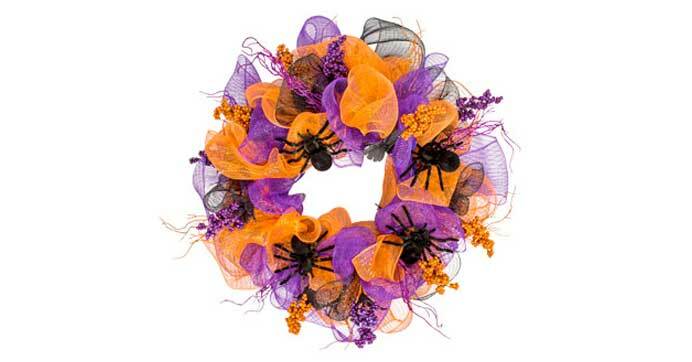 Visit DollarTree.com to shop our Halloween Deco Mesh Wreath idea and check out even more Halloween craft supplies.